Editor's Note: This column was co-written by Bob Morrison. “Power of Prayer, and a president.” It’s not often you read that kind of headline on the front page of the Washington Post. But the story—a powerful one of crushing political defeat and personal spiritual redemption—is what commanded our attention a couple of weeks ago. The news of former President Jimmy Carter’s very somber cancer diagnosis took all of Washington by surprise. Carter, at 90, seems a hardy perennial. He maintains an energetic schedule that would leave men half his age panting. We make no secret of the fact we questioned a lot of what Jimmy Carter did in the White House. So do we. Let’s remember one of those things we can sincerely praise in Jimmy Carter’s presidency. President Carter signed the Hyde Amendment in 1977. That measure was the first major pro-life victory gained by the nation following the infamous Roe v. Wade ruling of 1973. Whether President Carter wished to reduce the number of abortions by signing the Hyde Amendment’s ban on taxpayer-funded abortions, or whether he simply understood that forcing millions of us to be complicit in an act we see as homicide was politically harmful, he never really said. The important thing is that he signed the Hyde Amendment. And he stood firm on that principle at grave political risk. When Sen. Ted Kennedy challenged President Carter in the 1980 Democratic primaries, Kennedy’s liberal cohorts made sure full federal funding of abortion was a part of their attempt to unseat a sitting president of their own party. They wrote the plank for the 1980 Democratic National Platform. It called for full funding of abortion-on-demand. President Carter—though hard-pressed by liberals and conservatives—remained true to the Hyde Amendment. He wrote to the Democratic National Committee explicitly stating his opposition to federally-funded abortions. That took courage. Independent candidate John Anderson had obtained liberal mailing lists. To these donors, Anderson conducted an “under the radar” campaign assuring his liberal correspondents that he would make every American pay for the killing of unborn Americans. Wherever John Anderson was strong, he “tipped” the state’s Electoral Votes to the pro-life candidate, Ronald Reagan. Thus, we saw such liberal bastions as Massachusetts, Vermont, New York, New Jersey, and Wisconsin (and six other states) go to the pro-life Republican, Ronald Reagan. Reagan was the beneficiary of Carter’s principled stand against government-coerced funding of abortion. Of Reagan’s own pro-life bona fides there could be no doubt. H.W. Brands, in his recent Reagan biography,notes that Reagan asked George H.W. Bush just two questions: Could he support, generally, the conservative Republican Platform. And, very specifically, could he endorse Reagan’s opposition to abortion? Bush answered both questions in the affirmative. No small part of Reagan’s early political success as President derived from his stunning victory on Election Night, 1980. The election maps on the networks then showed Republican states in blue; Democratic states in red. When all of the Northeast went blue, the face of CBS News’ Dan Rather went green. We need to appreciate how strong a part abortion and the federal funding of abortion played in that critical election. And none of that would have been possible without Jimmy Carter’s principled stand against federal funding of abortion. How sad it is to see one of our major political parties wholly in the grip of Planned Parenthood. President Obama’s top campaign operative, David Axelrod. concedes that the secretly-recorded videos of Planned Parenthood operatives haggling for the hearts, lungs, and livers of the unborn children they have killed make people “very uncomfortable.” But it doesn’t make them uncomfortable enough to stop sluicing our money to these scavengers. President Obama himself made history—admittedly of a horrible sort—when he addressed a Planned Parenthood convention. He had promised to veto any bill funding the federal government that took away even one dollar from Planned Parenthood’s bulging budgets. He would rather close the government than let it proceed without finding these killers. “Thank you, Planned Parenthood. And God bless you,” Mr. Obama said to this gathering of abortionists. The irreverence and irony of this statement go beyond words. So, now, we can thank Jimmy Carter for what he did so long ago. And praise him at least for this special act of grace. 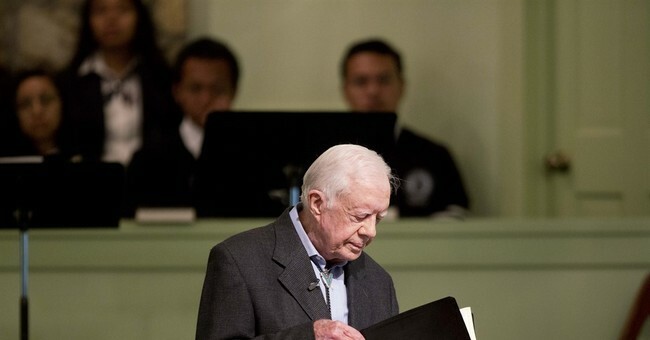 And we assure former President Carter and his family of our earnest prayers for him and for them. The yard signs in Plains look like a campaign: “Jimmy Carter for Cancer Survivor.” Amen to that!